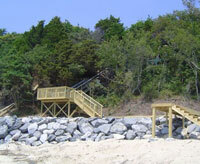 Kiptopeake State Park is a popular destination for beach-goers on Virginia's Eastern Shore. The park is located on the lower portion of the Eatern Shore peninsula, three miles north of the Chesapeake Bay Bridge Tunnel and ten miles south of Cape Charles, VA. The park has a nice sandy beach, a fishing pier, lodges, and camping areas for tents and RVs. There are five six-bedroom lodges, seven RVs, and a yurt (kind of a cross between a tent and a cabin) available for rent. Cedar Home with Private Pool - Located just down the street from Kiptopeke State Park. This 4 bedroom, 3 bath home has luxury amenities such as a theater room and a private swimming pool! Vacation home on Kiptopeake Drive - Located right outside of Kiptopeake State Park. Three bedrooms, two full baths. Sleeps six. Minutes from the beach at Kiptopeake. About 6 miles south of the town of Cape Charles. Beachfront Home near Kiptopeake - This five bedroom, 3.5 bath house sits on a high bluff with great views of the Chesapeake Bay. Sandy beach access. Large home with plenty of room with guests - sleeps 12. Located only about a mile from Kiptopeake State Park. Additional vacation rentals near Kiptopeake State Park. See listings located on a map - click on the dots for more information.